Histone H2A combines with Histone H2B to form the H2A/H2B heterodimer. Two H2A/H2B heterodimers interact with an H3/H4 tetramer to form the histone octamer. Histones are modified by various enzymes and can act as substrates for them. These modifications have been shown to be important in gene regulation. Because the histones are folded with their subunit partners, the dimer may be a better substrate for specific enzymes and modifications. 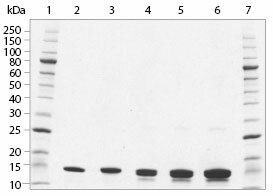 Purified H2A and H2B (NEB #M2502 and NEB #M2505) were denatured, refolded and the dimer was purified by gel filtration. To use as a substrate in an enzyme modification assay or other salt sensitive protocol, use 1 to 2 µl of the dimer in a minimum 20 µl reaction so that the salt concentration in the reaction ≤ 200 mM. To use as a substrate in an enzyme modification assay or other salt sensitive protocol, use 1 to 2 μl of the dimer in a minimum 20 μl reaction so that the salt concentration in the reaction = 200 mM.